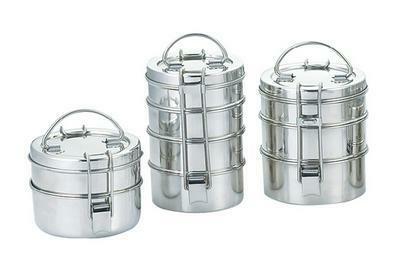 With our efficiency and immense knowledge, we are engaged in offering an excellent range of Tiffin Sada. Manufactured using top notched grade stainless steel and progressive techniques, these are designed in compliance with the set industrial standards. These are widely appreciated amongst our clients for their long life & perfect finish and are highly acclaimed in the market. Offered products are checked as per industry set parameters to ensure the entire range is free from any sort of production defects. “Neelam Appliances Private Limited”, was established in the year 1972, at Thane, (Maharashtra, India) is engaged in manufacturing, exporting, trading and supplying a better quality range of Cook Ware, Cookers, Aluminum Cooker, Dining Set, Hard Anodized, Kitchenware, Tiffin Sets, Miscellaneous Products and many others. Our products are manufactured with utmost precision by our skilled team of professionals keeping the clients’ specific needs and specifications in mind. Apart from this, we have incorporated advanced techniques in our production process, which helps us in remaining in pace with the prevailing market tendencies and developments. These products are accessible in various designs, sizes and patterns in order to fulfill the assorted needs of our treasured patrons. Clients can avail the offered products from us at the most reasonable price range.